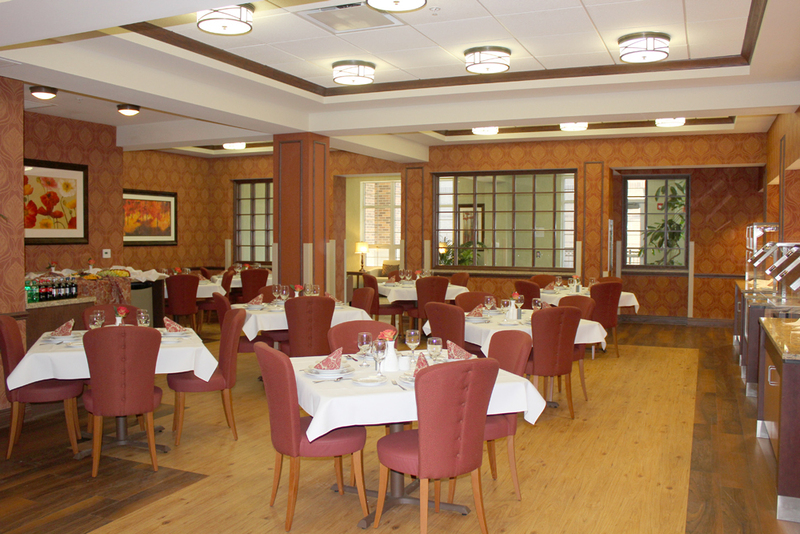 Generations at Regency (formerly Regency Rehabilitation Center) is very proud to be the winner of Long Term Living Magazine’s 2011 Best in Category for Dining Room – Remodel/Renovation. The following is an excerpt from the magazine’s September 2011 issue. Interior design and placement of furniture can help create a supportive, relaxing, and inviting atmosphere. In a healthcare environment like Regency Rehabilitation Center, the use of carpeting, wall coverings, art decor, lighting, and other design elements create a home-like environment. The design team renewed its vision to encompass the Baby Boom generation’s expectations of high-quality accommodations and areas that accommodate involvement of family members in resident care such as spacious, private rooms with Wi-Fi access and more. With an emphasis on creating a supportive environment based on residential influences, the team’s initiative in changing the dining room was to resemble restaurant decor using high-quality furniture and an inviting atmosphere. 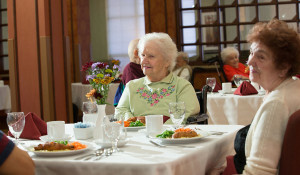 Other focal points include: opportunities for socialization and stimulation; a better dining experience for residents; the creation of a pleasurable, stimulation, homelike experience, to provide restorative focus using the proper placement of furniture in the dining area (part of a well-designed therapy program); and finally, to strive for a five-star restaurant and dining experience. In short, Regency Rehabilitation Center’s smartly designed environment can remind residents of the comforts of home. Regency has been providing quality healthcare services to the community for over 3 decades. During this rich history, Regency has built a solid foundation on the most important of principles in this industry – quality of care. It is this very foundation that generations of family members have counted on and trusts. In 2008, Regency entered a new chapter in its history with new ownership and a consulting team that recognized Regency is a very special place. The tools, resources and staff were now coming together and the vision was to make Regency, a home for many, even better. On May 12, 2011, Regency unveiled its New Beginning to the community. Now the physical environment and surroundings match the level of care: stellar. Great planning to every detail was made in the approach to design spaces that support a sense of community while improving the residents’ quality of life. Residents and guests are treated to new dining rooms, rehabilitation areas, resident movie theater, library, ice cream parlor, snack shop, resident rooms, common areas and much more. All planned to meet the needs of the residents and families in the 21st century. Welcome, not just to the New Beginning, but home.